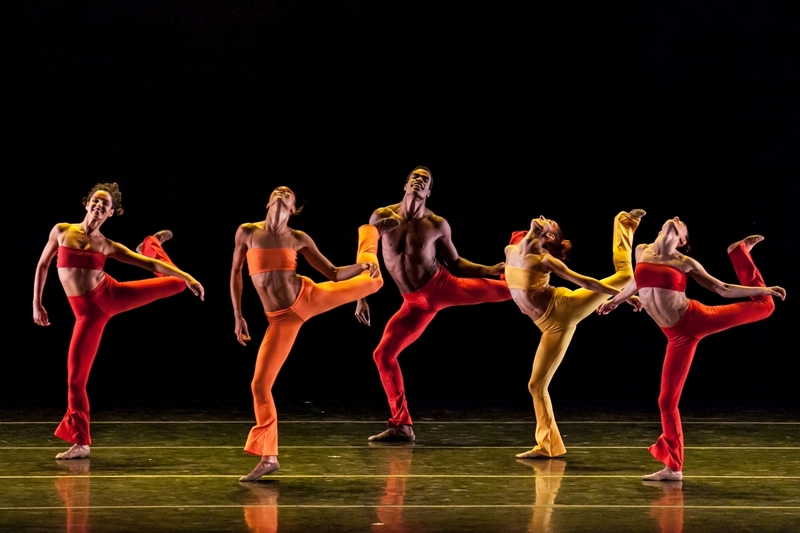 Classical lines, samba feet and salsa hips – Grupo Corpo presents a hot-pot of saucy styles boiled together to create a mix of the many influences of Brazilian culture and the poise of ballet and contemporary dance. Galloping onto the stage like Zebras, the dancers clad in full-length black and white body suits, co-ordinate complicated rhythms with their entire bodies, pounding along to the steady music of Lenine. Zebras are not native to Brazil, only being found in Africa but a link can be found with Brazilian ancestry in Africa and of course Portugal, a factor that is prominent in the many vocabularies that cohere and result in Brazil’s distinct dance forms. Triz – the first piece of the night brings ‘the sensation of being just a hair’s breadth away from the blade of the mythical sword of Damocles’. The chaos of being so close to demise is shown in the flamboyant and fluid ripples of each of the dancers’ torsos, contrasting with the control and precision found in speedy extensions of their legs. The piece feels like Cunningham on acid! A recognisable vocabulary of Merce Cunningham of curves, tilts and arches, is injected with swishing hips and the occasional strut in between footwork that is sometimes too fast for the eyes to focus. The strong cast of 20 own the stage with their insane athleticism and unbelievable clarity of manipulation over their limbs. However, I found that I sometimes needed the stamina of the dancers for my attention to be kept in such a lengthy piece. Nevertheless the pathways that the ensemble took through the fifteen kilometres of steel cable that hung from top to bottom of the stage hypnotised me as duets and trios often appeared as one with the symmetry in Freusa Zechmeister’s costume. Being truly transported to rural Brazil in Parabelo, a piece of repertoire that is 17 years old, drew out the personalities of the dancers who frequently appear identical in how they have trained to execute Rodrigo Pederneiras’ choreography. The structure that holds classical line and form together began to break down, as the machine-like dancers became human showing their joy and pride of being from such a vibrant and bold country. Flashing toothy grins their jubilation came to surface as they moved in trios linking and unlinking their arms whilst writhing in their upper bodies and displaying yet more intense footwork. The balance that Pederneiras finds in blending the vocabularies of different dance genres is enticing and helps to find a new perspective on how classical line and form can still find its way in 21st Century dance. Although you can see that the success of the company could go further to incorporate rebellious dance forms that exist in Brazil, such as Capoeira, which is also known as ‘the dance of war’. The company plays to a specific target audience that indulge in the high end dance scene, as opposed to something that may be more raw and interchangeable. You will be able to catch Grupo Corpo at Sadler’s Wells until the 4 October before the UK 2014 tour continues around the UK.